This is not an actual review since I don't have the Zbrush software to go through the tutorials. This book was borrowed from Basheer Graphic Books to see what's inside. The book's written by Scott Spencer who's a Zbrush instructor, character designer and sculptor. He has worked at Weta Workshop, Gentle Giant Studios, and has credits in several films and games. It's an intermediate book for anyone who wants to sculpt characters and creatures to a level of detail that's fit for film or games. 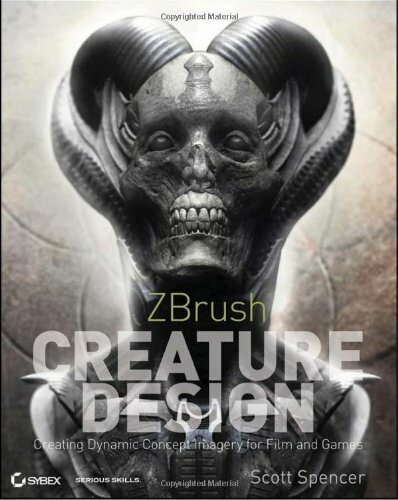 ZBrush 4R2 is the software version used in the book. Photoshop and Maya are used in some sections. The tutorials featured are in the form of projects where you get to model a character in ZBrush. There are different characters to model. Some of the projects span several chapters can cover topics such as the character design, posing, painting, lighting and rendering. The tutorials are step-by-step demonstrations you can follow along. A DVD is also included with video files of the tutorials. It's a thick 360-page book so it will take a while to go through. An ebook edition is also available . For those who bought the ebook edition, the exercise files are at booksupport.wiley.com instead of wiley.booksupport.com as mentioned in the book.